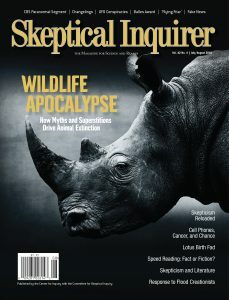 A leading skeptic addresses the essence of contemporary skepticism and highlights the vital nonpartisan and science-based role of skeptics in preventing deception and harm. Is training in speed reading valuable? It depends. After my article “Twenty-One Reasons Noah’s Worldwide Flood Never Happened” was published in the March/April 2018 Skeptical Inquirer, the creationist organization Answers in Genesis produced a YouTube video in which Andrew Snelling criticized some of the reasons I presented.